The provinces of Wei are the setting of an eternal clash between fantasy-Japan, fantasy-China, and the ancient oni living in the mountains. It’s a land with a shrouded history and many secrets. Where dreams seem at times to overlap with reality, and ageless dragons hide in the shape of humans. 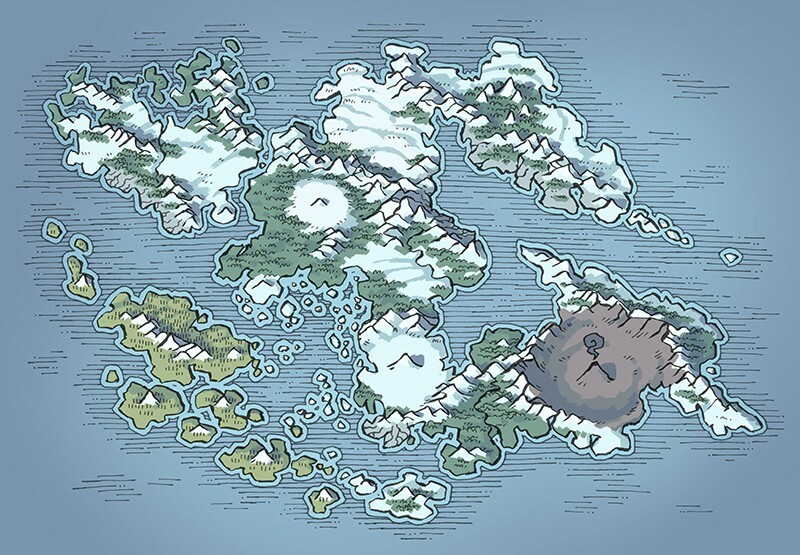 I drew this in preparation for the release of LegendKeeper, a cloud-based application for building and organizing fictional worlds. I’m very excited to be involved in its development, and am dying to get my hands on it. I highly recommend checking it out. It’s going to be a real game-changer for my own campaign organization. That all said, this map doesn’t need to be the start of a new campaign for you. It also makes for a great “across the seas” location for your campaign — don’t we all have that player who want to play a zany race that doesn’t fit into our current setting? (I’m looking at you, Jeff the cowboy). Alternatively, it’s a place for the party to visit they accrue such a bounty that their only option is to flee the continent! Patreon supporters, grab your exclusive Parchment version here. Thank you! Owen Eli Cook, Patrick O’Hagan, Nicholas O’Sullivan, Jain Deaux, Sam Wise, Matt C. @mc_momo, Dantemagnum, dmslayer, Brian Barron, Chris Logan, Joel McKinnon @joeliemckinnon, Felix Jongleur, Stephon Mikell, Cansin Akcasoy, James Ball, Joshua Renz, Austin Auclair, Sam Mean Man, Jeff Sorensen @DelugeIA, eddy zrout, Ronin, Edwin Bryer, Håkon Eirik Grønlien, Ty Hajduk, Rickard Thernlund, Julien Therrien, Matthew Kammes, Wilhelm Lehnhardt @3mporio, Tyrian @its_tyrian, Poptard, Capela, m00am, Jeanette OB, Danny Mendoza @dannyrmendoza, Joel Quadko McIntyre, Tyler Crompton, FreedomXIII, RoninDude, Tiana, Dawnbright., evilhomer10 @evilhomer10, Jake Raiju, Peter Fox, Zachariah Bazeley, Tad Bumcrot, Bruce McDonald, Robert Cater, Ian Sheridan @iansheridan, Allin Knight, Justin Hunter, RiddleJacks, Caleb Longshanks Lee, Jonathan Petersen, Maciej Stachowiak, Dustin K. Miller @geonerd, Stephen Perkins, Jamieson Mockel, Calvin Clark, Zachary Robinson, Maxime Durocher, Jens Nielsen, Arcknight @arcknightgames, Michael Leimenmeier, Jordan Baker, Justin Foster, Amanda Fensch, Nick Fraker @ikaruwa, Miles Grubbs, Aidan G, Taylor Worthington, Elliott Uribe, Steffen Bensch, Emily Forrette, taylor eubanks, soren, Benjamin Busseniers, Kristina Coker, Dylan Bender, Sheila Motter-Schuk, Annie, Ievgen Kharabet, TheAussieBrit, Clay, Daniel, Jonathan Streeter, Wim, Gray, Joe Brooks, Daniel Kolev, Bill Underwood, Gabe Barrett @BGDesignLab, Mike Elston, Seyren Windsor, Brandon, Ian Rawley, Blair, Jonathan Climas, Weekendswitch, 1 Adventure Frameworks, Ardis Ramey, Adam Astra, Agnieszka Kaniewska, Berringer, Broc Abrams, Hayden Walker, Kyle Sternad, Nancy Saunders, YUM-O, Lewis Payea, Andrew Smith, Morten Sunde, Nathaniel Hodges, Mario J Roberti, Cristhian Vargas, Alexander M., Jesse Bethke, Morgan Ezra, Paul Pollard, Richard H Adkins Jr, RupertG @diceofdoom, Serf, and all my other wonderful Patrons! I could see myself using this as a mist-shrouded archipelago that my players have received a mysterious invitation to from an unknown source after they’ve made a name for themselves! Beautiful! 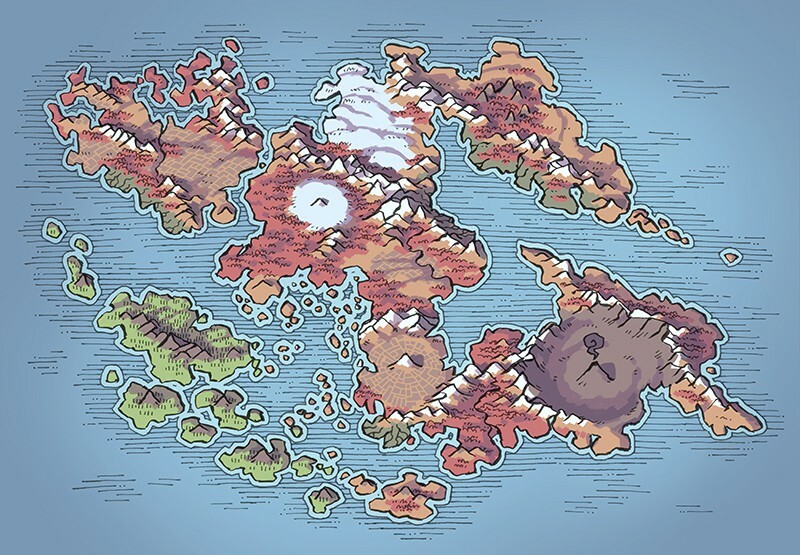 With a bit of retouching, this map could stand in as an alternative Avatar: TLA world setting. 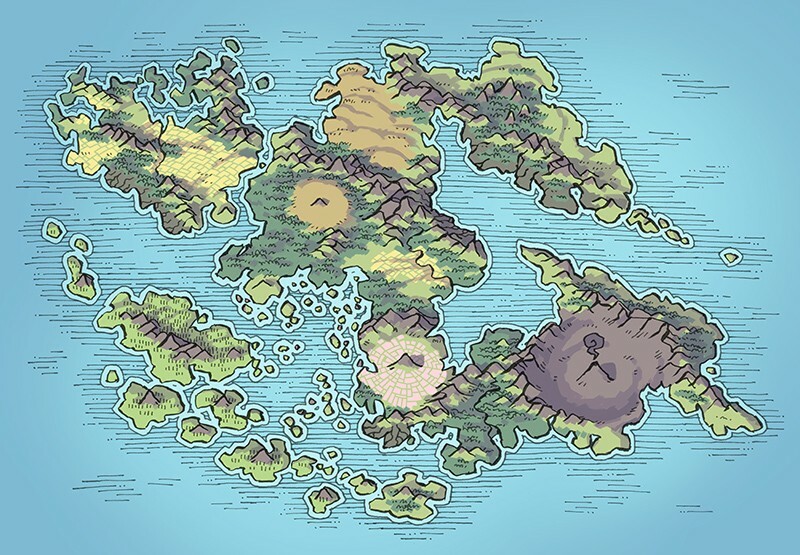 I could view this as the world splitting format I have for a realm in my 3+ year campaign. Essentially the world is split into a fire, water, earth, and air varients where that magic is so saturated that it is a part of the world.